Zscaler Mobile Security delivers advanced security, compliance and traffic visibility across device platforms and ownership models. You can even seamlessly separate business and personal usage, ensuring that any malicious content downloaded during personal use cannot gain access to sensitive corporate assets. The use of mobile devices is here to stay. It estimated that by 2016, there will be over a billion smartphones and over 760 million tablets in use globally. The line between ‘personal’ devices and ‘business’ devices is fuzzy. While some organizations still issue mobile devices to their employees, “bring your own device” (BYOD) is increasingly becoming the norm in non-regulated industries. As an IT professional, you are well aware of the unique challenges of supporting mobile devices—ranging from platform proliferations, ownership models, and the sheer volume of personal and business apps available for instant download. Zscaler’s Mobile Security Solution is custom built to address the evolving challenges of mobile data and app security for both employee-owned and corporate-issued mobile devices. 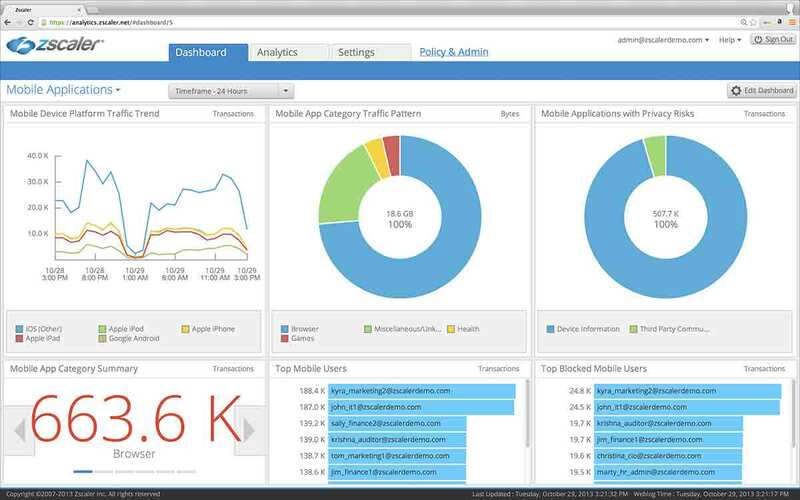 Simply forward your entire mobile traffic—browser and app—to Zscaler. We analyze both inbound and outbound traffic in real time to ensure that your users are protected against Advanced Web browsing threats like phishing or spyware, as well as malicious or rogue apps, and apps that may pose security or privacy risks to data on the device. Zscaler Mobile App ProfilerTM technology enables us to protect mobile apps based on the network traffic, identifies the device platforms the apps were running on, and flags any security or privacy risks that they may pose. All this is achieved with minimal latency—thus maintaining optimal user experience. Whether you provide your employees with mobile devices or your users bring their own, it does not matter—Zscaler has you covered. Struggling with managing iOS vs Android? We have solutions for any platform—Zscaler has you covered. The whole point of mobile security is that it needs to be mobile—not just in where it is used, but how and when it is used. As the IT administrator, you retain complete visibility and control—you can set granular user level policies, including data loss prevention (DLP) and compliance mandates, across a user’s multiple devices. The analytics and reporting portal provides instant and detailed visibility through a ‘single pane of glass’—identifying mobile browser and app traffic, application usage patterns and security and privacy threats. The intuitive and user friendly interface provides graphical, in-depth views into user transaction logs—you can run reports for reporting or incident analysis and easily identify mobile apps that may be the source of security incidents. Along with Zscaler’s other capabilities such as URL filtering, anti-virus, and APT protection, mobile traffic can be analyzed in full context of a user’s Internet usage—across devices and platforms. This enables dynamic forensics and remediation steps to pinpoint attack and risk vectors in your environment.